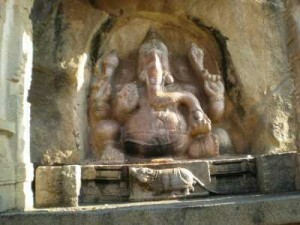 The monolith Nandi seated right across the Veerabhadra Swamy temple in this small town some 100 km from Bangalore has today come to be a symbol used to depict the pride of Andhra Pradesh. The temple constructed in the Vijayanagar style has its own importance among the serious-minded pilgrims. To the south of the main shrine is a huge Nagalingam with a large seven-hooded granite cobra as shroud. It is about 100 km from Bangalore and 16 km from the nearest railhead Hindupur on the Hyderabad – Bangalore railway line. Hindupur is also on the national highway to Bangalore. This entry was posted in Andhra Pradesh, Lepakshi. Bookmark the permalink.